Recently described and known to me only by the descriptions and the photographs, published by Šutara & Skála (2007) and Šutara & al. (2009). Cap up to 6.5 cm, at first hemispherical then convex, orange red, bright red to vinaceous red, dry, velvety and soon cracking. 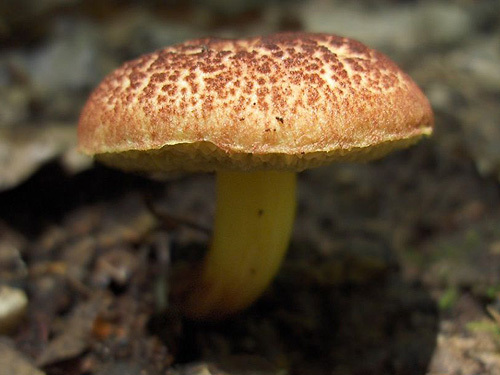 Stipe cylindrical or club-shaped, often curved at the base, pale yellow to yellow, at the lower half with reddish tint. 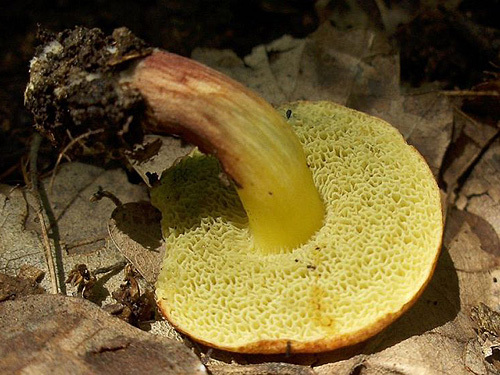 Flesh yellowish, yellow above the tubes, somewhat reddish or vinaceous in the lower half of the stipe, blueing when exposed to air. Smell not distinctive. Taste not distinctive. Spores 10.5–19 × 4.5–7.5 μm, smooth, truncate. Pileipellis (the cap cuticle) a palisadoderm of septate hyphae. Hyphae composed of nearly ellipsoid to cylindrical, incrusted cells. Habitat. In deciduous forests, mycorrhizal probably with oaks (Quercus). Distribution. So far known only from the Czech Republic and Hungary. It is possibly more widespread but overlooked and it should be looked for. Similarity. Xerocomus marekii shows similarity to many other xerocomoid species with red-coloured caps. Xerocomus rubellus is distinguished by the characteristic bright orange red spots in the base of the stipe and also by its non-truncate spores. Xerocomus ripariellus is distinguished on the base of its striate non-truncate spores. Xerocomus fennicus also has truncate, but striate spores. Xerocomus porosporus has truncate, smooth spores, but is distinguished by the differently coloured cap and stipe that do not show red tints. Xerocomus dryophilus has non-truncate, smooth spores. Xerocomus silwoodensis (belonging to the X. subtomentosus – group) has not blueing flesh and non-truncate, smooth spores. 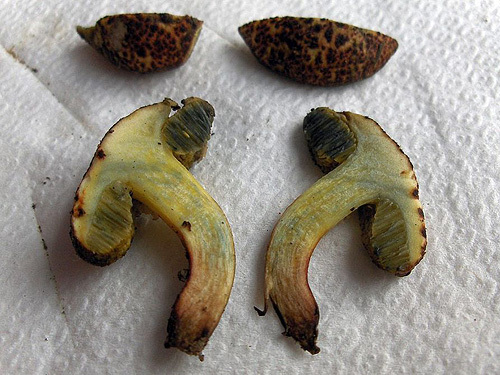 As most of the species of this genus, X. marekii is apparently very variable fungus. Martin Kříž on the Slovak site Nahuby presents a photograph of a young fruitbody. Click here to see it. Illustrations of the microscopic features and some more colour photos are published in Šutara & Skála (2007), Šutara & al. (2009) and Dima & Albert (2009). Klofac, W. 2007. Schlüssel zur Bestimmung von Frischfunden der europäischen Arten der Boletales mit röhrigem Hymenophor. – Österreichische Zeitschrift für Pilzkunde 16: 187–279.